Bo Jackson played Major League Baseball between 1986 and 1994, although the latter half of his career was severely limited by injuries. For his career he hit .250 in 2393 at-bats with 141 home runs and 82 stolen bases in 114 attempts. He had 341 runs, 415 RBIs, 86 doubles and 16 triples. His career OPS was .784. Known for his strong arm, Jackson finished his career with 44 outfield assists. Jackson put up his best statistics in 1989. Playing for the Kansas City Royals he hit 32 home runs and drove in 105, both good for fourth in the American League. He led the league with 11 outfield assists and also stole 26 bases. On the downside he also led the league with 172 strikeouts. 1989 was the only year Jackson made the All-Star game. He made the most of it, making a terrific play in the top of the first and then homering to lead off the bottom of the first. He later stole a base, joining Willie Mays as the only man to hit a home run and swipe a bag in an All-Star game. In many ways, Jackson 1990 season was even better. He slugged 28 home runs and finished with a .272 average and a career high .866 OPS, which would have been sixth in the league if he had enough at-bats. But Jackson missed 51 games in 1990, which reined in most of his counting statistics. Going forward, he would never play in more than 85 games for a season. In 1991, Jackson injured himself playing football and required hip replacement surgery. The Royals released him, fearing he wouldn’t fully recover from the procedure, and Jackson caught on with the White Sox. He was ineffective in 23 games during the 91 season and then sat out the entire 1992 year. He continued to struggle in 1993, hitting just .232 in 85 games. He signed with the California Angels in 1994 and although he only got into 78 games that year he hit a career high .279 and managed 13 homers. He was awarded the American League’s Comeback Player of the Year. Jackson retired during the the 1994 players strike. Jackson had always been a big baseball prospect and was drafted in the second round by the New York Yankees out of high school. But Jackson decided to instead attend Auburn University where he played baseball and football. Bo excelled on the gridiron and won Heisman Trophy in the 1985. Because of Tampa Bay’s failure to sign Jackson his name went back into the 1987 draft. The Raiders took him in the seventh round, and team owner Al Davis made it clear they would be fine with Jackson as a part time player who would join the team only when the baseball season was over. Jackson did just that and electrified the league in 1987 with 554 yards on just 81 carries for an absurd 6.8 yards per carry average. For his four year career he would average 5.4 yards a carry, with his best year coming in 1989 when he rushed for 950 yards in just 11 games. 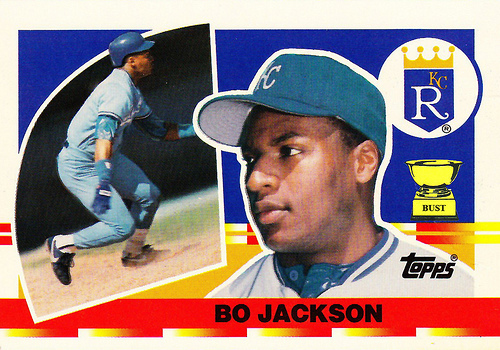 Thanks to his status as a two-sport star Nike rolled out the “Bo knows” ad campaign in 1989. The humorous spots featured Jackson promoting the the brand’s cross trainers by playing just about every sport under the sun. The commercials made Jackson into one of the most visible sports stars in the world. During a playoff game in January of 1991 Jackson seriously injured his hip while being tackled. When they went in to fix it they discovered Jackson had a degenerative condition and needed a hip replacement. That immediately ended his football career, put a damper on the progress he was making as a Major Leaguer, and eventually led to his baseball retirement at age 31. 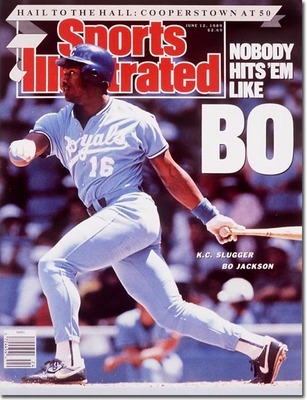 The story of Bo Jackson is very much a tale of what if. His NFL statistics suggest he could have been one of the best ever if he had just stuck to football. However, since he had the degenerative condition a football-only career would have been a ticking time bomb. 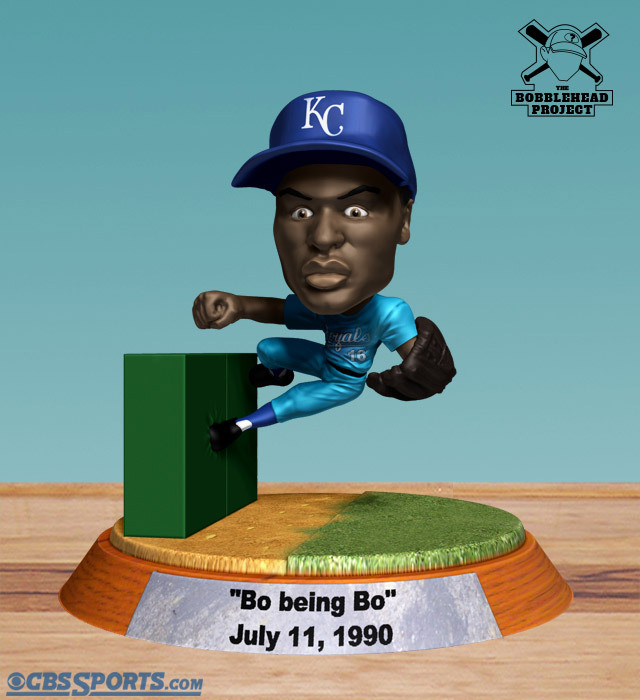 He never had quite that impact on the diamond, but Bo’s 1989 and 1990 seasons did suggest he could have been an all-star level player if he never got hurt. Of course we will never know. But, even with the injury, Jackson has quite a legacy. The man was one of the most exciting players of his era in two sports. And he also sold a whole lot of shoes.